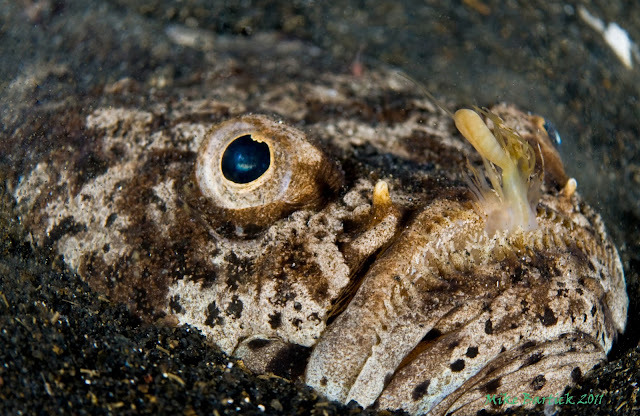 Critterhead: Whitemargin Stargazer: "Whitemargin Stargazer ~ Uranoscopus sulphereus The Stargazer Is a true Ambush Predator. Burying itself up to its eyes in sand, it patient..."
The Stargazer Is a true Ambush Predator. Burying itself up to its eyes in sand, it patiently awaits for its next victim. A shrimp on the prowl, a curious little fish, squid or perhaps an eel. The strike speed is amazingly fast pulling its victim under the sand for consumption.While i was shooting this photo a lure shot out of its mouth and began waving around like a party favor. I have never seen anything like it before or since. It was very quick and hard to anticipate. Look closely, part of that lure is sticking out from its skeleton like jaws.